Chandler Jones being worked on on the sideline. Trainers looking at his right arm. 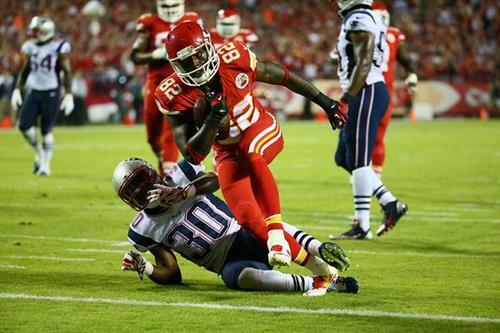 Dwayne Bowe has 3 catches on 3 targets into Darrelle Revis' coverage. Sebastian Vollmer comes out, Marcus Cannon comes in at right tackle. Brady would have easily had the first down if he ran it. Tom Brady with an uncharacteristic bad decision, would have had a first down by a mile, but wanted to throw to Edelman. Astonishing how every single decision is wrong. A lot of GMs would be fired for what the #Patriots have put together on offense. #Chiefs are putting on a clinic. How is Jerod Mayo matched up on Dwayne Bowe?